Partnership With Native Americans (PWNA) brings much-needed relief to 250,000 Native Americans each year. That assistance is accomplished through more than 1,000 partnerships on 60 reservations across 12 states. Many of those reservations are located in isolated, hard to reach areas, meaning geography has an impact on the everyday lives of those we serve. You likely don’t think about how geography affects your daily life, but for the people living on these reservations geography impacts their access to basic amenities, nutritional food, job opportunities, and contributes to a feeling of isolation. 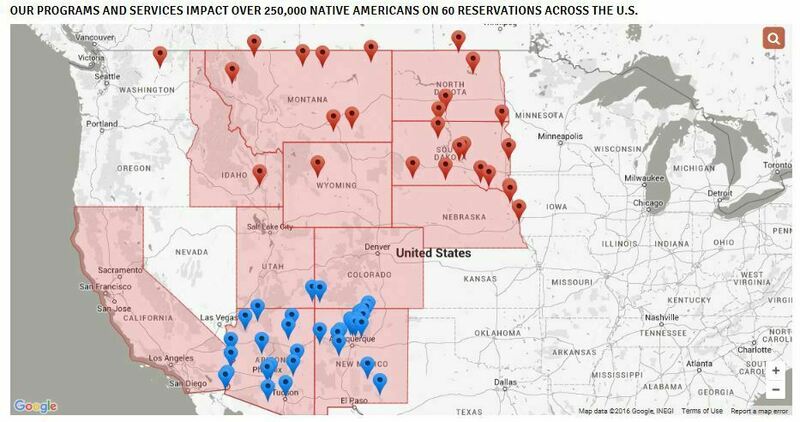 Viewing the interactive map of the 60 reservations PWNA works with, it’s easy to see why assistance is needed. Turtle Mountain Reservation in north central North Dakota is practically on the Canada/U.S. border. While the reservation has attracted commerce to the area — a Bulova watch factory, casino, industrial park, shopping mall — it’s not enough. One in three resident Chippewas is jobless, and many of the resident tribal members live on $4,681 a year. The Rosebud Reservation is located in South Dakota and the remote nature of the reservation means many roads are often in disrepair and transportation options are limited. Unemployment reaches as high as 80 percent due to the lack of job opportunities. The Zuni Pueblo in New Mexico is the largest pueblo in the state, with the lowest per capita income. About half of the students are not completing high school, and more than 44 percent of the population is living in poverty. PWNA is working in partnership with these reservations and others like them to provide emergency services, capacity building services, school supplies for K-12 students, scholarships for high school graduates, health services, animal welfare, food and water donations and much more. These are only snapshots of the challenges people living on the reservations face, and a glimpse of the impact you can make by donating to PWNA. Help us change these realities and donate today. This entry was posted in Humanitarian, Programs and tagged donate, map, Native Americans, partnerships, poverty, reservations. Bookmark the permalink. Trackbacks are closed, but you can post a comment.